As the High Court in Johannesburg grapples with the question of whether some schools in Gauteng must teach in two languages, in Venda it is the courts themselves which have a language problem. Too often, individuals who appear before the courts in Venda are denied full access to justice because of the language they speak – or don’t speak. Cities like Thohoyandou and others across Venda attract people from across this diverse country, and not all are fluent in Tsivenda or Xitsonga. While the police in Venda are most often able to articulate the rights of the arrested person in that person’s vernacular, the next step of the judicial process – the courts – might as well be in Greek. In actuality, the courts in Venda and throughout South Africa use English (and sometimes Afrikaans). All other languages must be translated, and the interpreters employed by the courts must not only translate the words, but also the ideas and concepts behind them, serving as something of a ‘culture broker’. Needless to say, the meanings of words and phrases are fluid between languages – sometimes within languages. What if the true meaning of words or legal concepts is lost in translation? It can happen. In Venda, qualified interpreters are often unavailable, meaning the court sometimes utilises interpreters who are not professionals, and who are not made to take an oath. Researchers have recently identified several cases where inadequate translations between English and other South African languages have proved to be an impediment to – if not a miscarriage of – justice. Would you want your loved one’s life or liberty to be at the mercy of a bad translation? The problem of interpretation is even worse when it comes to sign language. The courts do not have sign language interpreters, and rely on the assistance of Tshilidzini Special School, which works with people with hearing disabilities. Still, there is at least one case that has dragged for years because of lack of qualified sign language interpreters. It should be remembered that the South African Constitution recognises eleven official languages. It also obliges the national government to advance the use of these languages. This obligation extends to the provincial level, as well. People in different provinces are entitled to use the language they prefer in their dealings with government agencies. Yet, in continuation of a legacy that marginalised indigenous African languages, only Afrikaans and English are used for official purposes. This status quo is recklessly accepted, and the right to access to justice in one’s vernacular is brushed aside, even by the courts. The importance of conducting trials in English is not in dispute. Recording court transcripts in English is vital to the efficient function of the appellate system, and critical to ensure due process for all parties. However, it is no less important that we do everything possible to guarantee the full legal protections and human rights of our fellow South Africans. This includes their linguistic human rights. There is no good reason that allows courts to disregard applying the multi-lingualism adopted by the Constitution. The courts are supposed to be the prime guardians of human rights, yet they often violate the linguistic human rights of persons who speak only indigenous African languages. 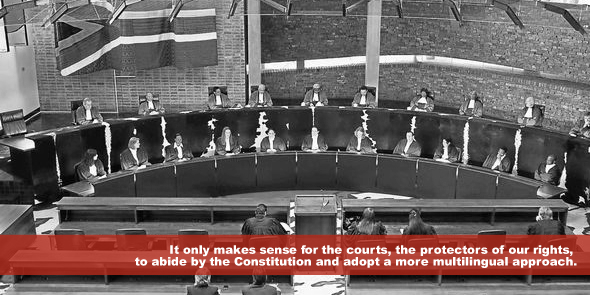 Instead of prioritising the rights of individual South Africans, whom the courts are intended to serve, the actual practice prioritises the convenience of judicial officers. Judges are not keen to learn and use indigenous African languages because they can rely on interpreters. This needs to change. The use of indigenous African languages has to be given effect by the courts. As such, courts should adjudicate in the vernaculars, without the use of interpreters as much as possible. The composition of the judiciary should be inclusive of speakers of all the official languages. Judges who speak vernaculars have to be made to work in those places where the vernaculars are spoken, so as to avoid reliance on interpretation. Accordingly, judges who speak Tsivenda and Tsonga should preferably be placed in Venda. In addition, the national and provincial governments must invest in, enhance the capacity of, and regulate the profession of court interpreters. Even when court officials are conversant in local vernaculars, interpreters will continue to have a crucial role in the South African legal system, especially in Venda. It only makes sense for the courts, the protectors of our rights, to abide by the Constitution and adopt a more multilingual approach. Otherwise, in Venda and across South Africa, we may continue to see a misinterpretation of justice. Abiy Alemu Ashenafi is currently an LLM student in Human Rights and Democratisation in Africa at the Center for Human Rights, University of Pretoria. He has worked as an assistant judge in Hadiya Zone High Court, and as a lecturer in Jimma University in Ethiopia. He holds LLB (Ethiopia) and LLM (Ethiopia). His research interests are Constitutional law, Tax law, and African human rights system.